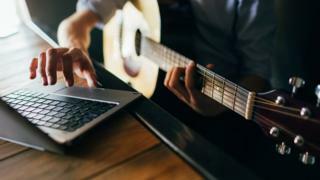 Music teaching could be left behind in an outdated acoustic age if it does not keep up with technology, an in-depth report says. Too much music education does not reflect the reality of how young people engage with music, according to the inquiry from the Music Commission. It says there is a risk this "disconnect" means current teaching methods may become outdated. It argues technology could help stop music from disappearing from schools. The commission, led by key figures in contemporary music and set up by the Arts Council England and the Associated Boards of the Royal Schools of Music, says technology is evolving at a rapid rate. From apps that allow users to compose digital music on smart phones to 'teach yourself the guitar' YouTube videos, the opportunities technology offers for learning, making and engaging in music are significant. The report says: "There is a danger that the "disconnect" between how young people use technology and music education may see current models of teaching rapidly becoming outdated. "This is not about one replacing the other, but about bringing together the best in technology to work alongside and challenge acoustic music-making to create more relevant contemporary practice." It adds: "The current generation of music learners can explore any era or kind of music at any time. "Technology allows them to access and to merge 'musics' from any culture." The report highlights how technology has enabled young people to improvise together, access virtual teachers and challenge each other in digital spaces. It adds that new technologies increasingly provide accessible, low-cost means to make and share music, and that it should be a central plank of music education. It adds that the accessibility and immediacy of such technology means young people can have a more fluid approach, with the old barriers between different types of music being broke down. The report also says that the focus of music education should be ensuring every child is supported to take music further. A report by the Musicians' Union last year suggested poorer children are being priced out of learning musical instruments. Children in low income households were half as likely to take music lessons, it found. Commission chairman, Sir Nicholas Kenyon, who is managing director of the Barbican, acknowledged there was a host of pressures on schools to meet academic targets. He said: "People of all ages now learn and enjoy a hugely diverse range of music in many ways - at home, in classrooms, in communities and online. "However, we're concerned that too much music education does not reflect the realities of how young people engage with music."